Here is an instrument that is reduced to the essentials: an 8’ principal chorus and contrasting flute sounds on two manuals and pedal. A basic complement of pitches and sounds are paired with a simple, sensitive mechanism. The scaling and voicing of the pipework is chamber-oriented for hours of quality work without aural fatigue. The entire instrument is contained in a compact casework made of cherry with curly maple and ebony secondary woods. The dimensions of the instrument allow free placement in a home, apartment, or small studio room. The organ fits under a nine-foot ceiling. Since small organs move as frequently as their owners do, this unique design keeps the action in adjustment during relocation. 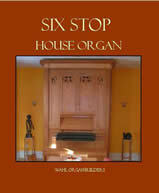 This was well demonstrated when the Philadelphia organ was moved from its original installation in Madison, Wisconsin. The modular design allows quick installation, typically taking only a few hours. Built-in wheels allow organ placement against a wall while enabling easy access to the back of the instrument.